Gluten free. Soy free. Nut free. Cruelty free. Phosphate free. Dye free. Perfume free. No harmful synthetics. UV brightener free. Many household cleaners contain harmful and harsh chemicals in order to get the job done. However, these days you have a choice so you don’t have to expose your family to these chemicals to get things clean. 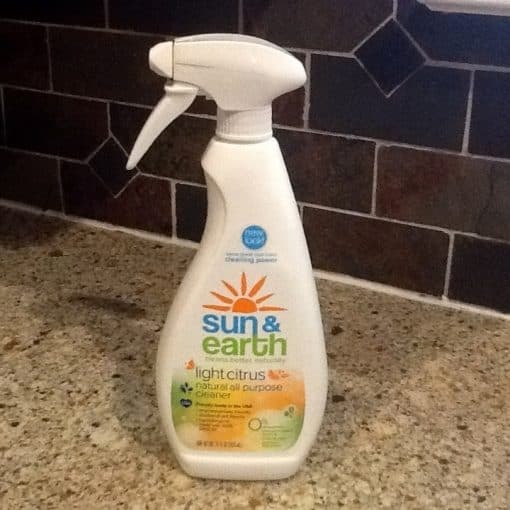 Sun & Earth Natural All Purpose Cleaner is a great, natural product that also does a great job of getting your home clean and smelling great. This product even earned an “A” rating from the Environmental Working Group Guide to Healthy Cleaning so you can feel good about using it in your home. I found this product at a local grocery store so you can try out one bottle first before purchasing the multi-packs available on Amazon.